The smell of garlic and onion fills the air in the Spec’s Wine Lab at the Hilton College of Hotel and Restaurant Management, but what Chef Hugo Ortega puts into the pan next might surprise you — or even gross you out. “I am going to add some grasshoppers,” Ortega said. The Mexico native and popular Houston chef is making Tacos de Chapulines or grasshopper tacos and ant mole. “It is part of our daily life, it is part of our culture,” Ortega said. The James Beard Award-winner has been serving edible insects at his restaurants for over 15 years. 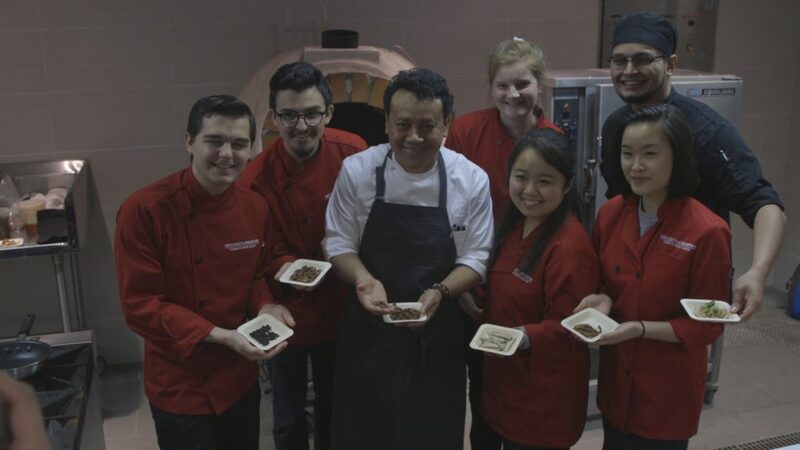 As part of the inaugural celebrity chef event with UH Dining and Hilton College, Ortega demonstrated how to incorporate insects into your diet and their health benefits. “One ounce of grasshopper has as much nutrition as six ounces of burger,” Ortega said. At least 2 billion people worldwide eat insects as part of their diet, and they are high in nutrients while being more sustainable than traditional livestock.